A properly formed film plays a vital role in the quality of coatings. This book provides a comprehensive overview of all aspects of film formation, from application to coatings technology, including the underpinning scientific principles. Mischke enables the reader to gain an understanding of all aspects of film formation: basic coating concepts, the scientific principles of film formation, and practical aspects of the application of coatings. This approach enables those without an advanced scientific background to fully understand the principles that underlie film formation. It also provides invaluable best-practice guidance in the formulation of perfect coatings that meet the highest standards of quality and durability. Film Formation in Modern Paint Systems provides an essential guide for novices, students and professionals wanting to deepen their theoretical knowledge and practical understanding. It is also an invaluable reference for experts, providing troubleshooting and scientific information for a wide range of problems and challenges. 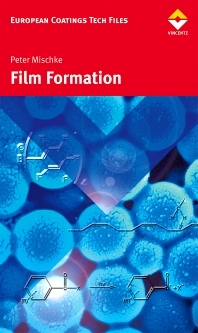 In addition to the fundamentals and techniques of film formation, this book covers the polymer and physico-chemical aspects of film formation in detail. Mischke is one of Europe’s most active coatings educators, and his approach to this subject matter enables readers who lack an academic background in chemistry to understand the more specialized content of the later chapters without a prior background in academic science. Peter Mischke also offers a wealth of practical insights, techniques and rules-of-thumb derived from his extensive professional and training experience. Holistic overview on film formation covering all aspects from theoretical background to application. Extremely efficient access to the process of film formation. Coatings professionals in a wide range of industry sectors: consumer goods, automotive, construction products, etc; students.